Graffiti: A Social Kitchen is the latest creation from chefs and brothers-in-law Brian Okin and Adam Bostwick. I recognized a few of the items on the menu from the pop-up they did at Toast last year, which I consider to be the best meal I ate last year. I’ve heard nothing but good things about Graffiti from everyone who has been there, so I organized a dinner there recently. 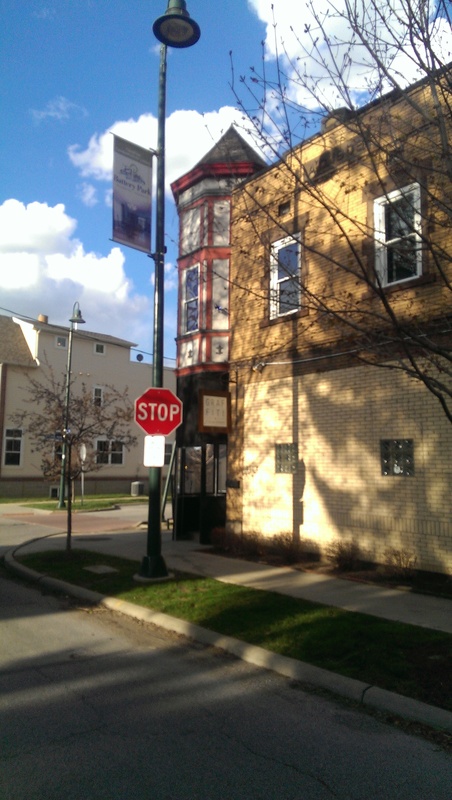 The restaurant is located in the building where Reddstone used to be, so I can’t wait it is patio season. The bar has been redone and is covered in nickles. It is a nice place to sit and enjoy some drinks and a nosh. Our group was seated in the dining room upstairs. If you have trouble with stairs be forewarned. If you really have trouble with stairs grab a table in the bar. 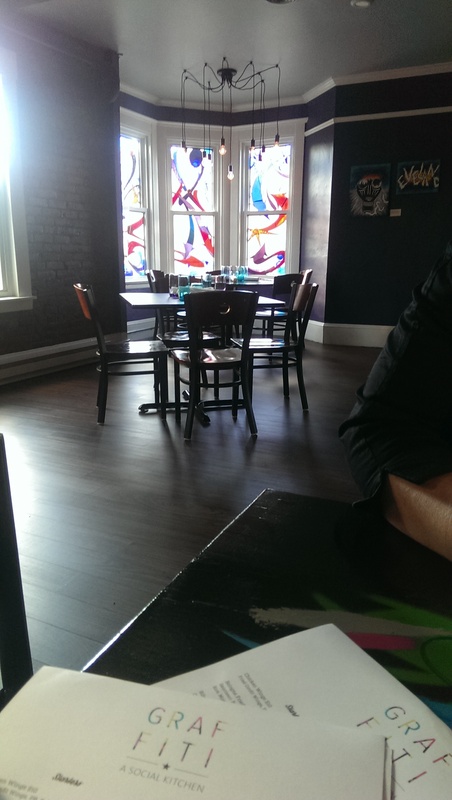 The upstairs is really beautiful, featuring stained glass in the windows and whimsical light fixtures and artwork. I also really have to say I love the music they play. They have several channels they use, but the theme is eighties music. My kind of music. I jammed to the Cure, Depeche Mode, and David Bowie to name a few while enjoying my drinks and the food. 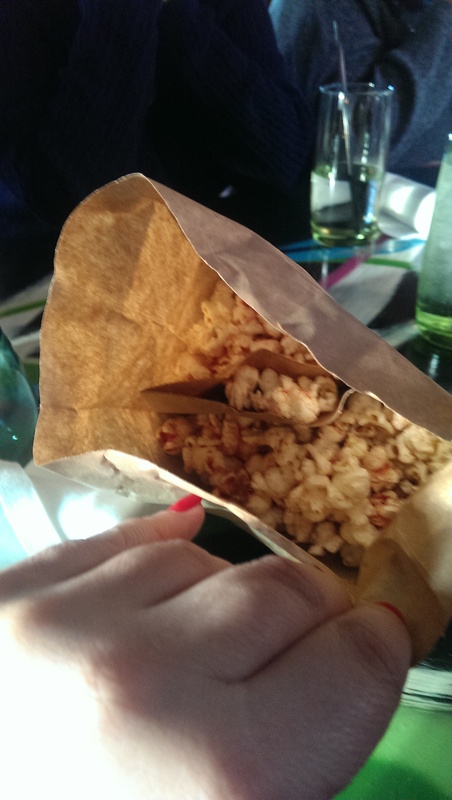 Instead of bread they serve paper bags of flavored popcorn. The flavor varies every day. The day we were there it was a tomatillo popcorn. Another day I was there it was jalapeno cheddar. It is a fun and unique item, and makes you really thirsty. Hats off to that idea. 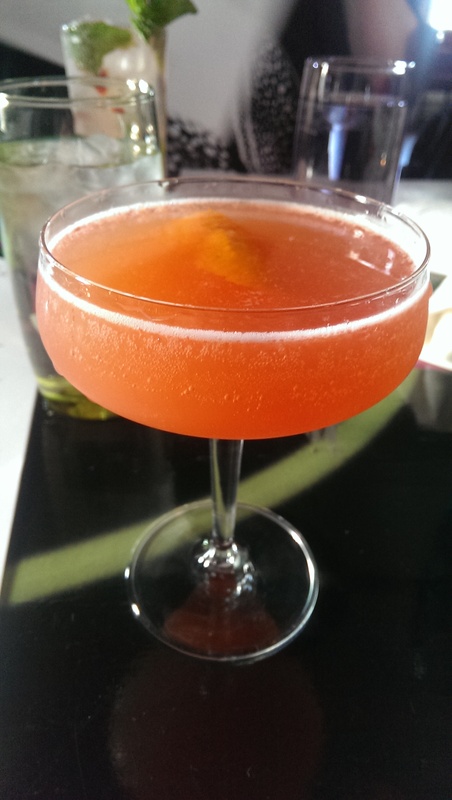 I have been on a blood orange kick recently, so I didn’t order my usual C&C drink, Stellar, and chose She’s A Woman. This was just a really delicious, refreshing drink. In fact, I’ve ordered it every time I’ve been back since. I couldn’t decide on an appetizer, so I was very pleased to see the Graffiti Artist, which allows you to order three appetizers to share. They weren’t samples either – they were the full appetizer servings. One of my friends wanted to try the Ribs so I then decided to order the Toad in the Hole Bologna Fried Rice (because that was one of the items at Toast) and the French onion egg rolls. Luckily another friend ordered the Potato Skins, because that was my favorite out of the four appetizers we had. The Ribs are corned baby backs similar to the Reuben Ribs that everyone loves at Cork and Cleaver. However, this one is a more Cleveland take on ribs, featuring shredded Napa cabbage, pickle slices, horseradish, and Stadium mustard. The meat fell off the bone, and the Napa cabbage and dressing the ribs sit on is really delicious. 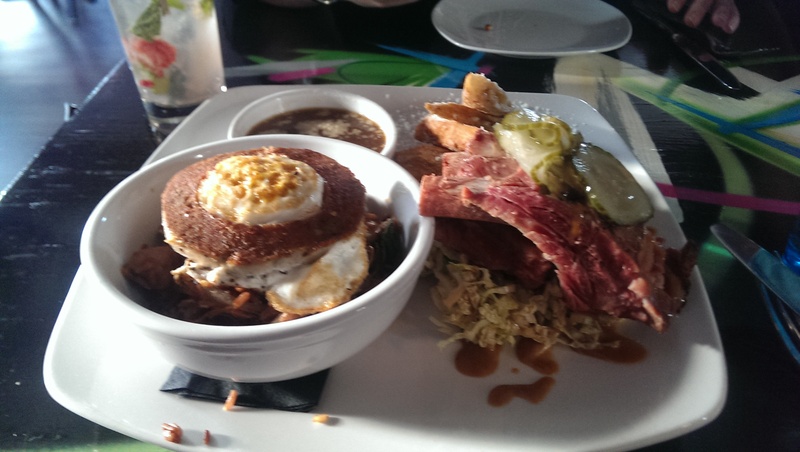 The Bologna Fried Rice is made with Saucisson bologna Toad in the Hole, Himalayan red rice, mire poix, and soy sauce. The rice was a little dry, but I really loved the combination of egg and bologna. And no one does meat and charcuterie in Cleveland better than Saucisson. The French Onion Egg Rolls taste exactly how you think they would, like French onion soup and delicious. 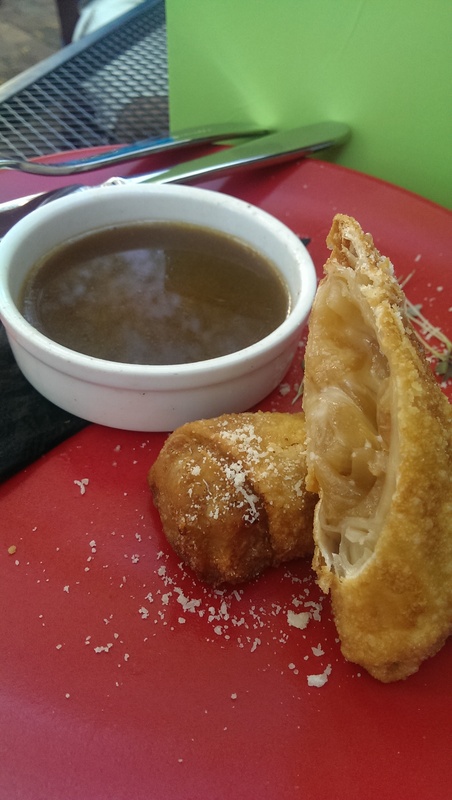 The crispy wonton wrappers are packed with caramelized onions and Gruyere cheese and it is served with a French onion jus to dip the egg rolls in. Again, this unique twist really worked for me. 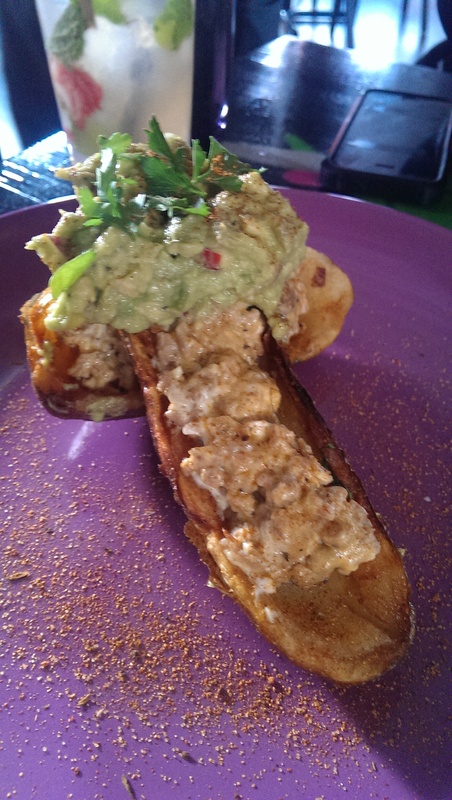 The potato skins feature crispy Russet potatoes, chorizo, goat cheese and guacamole. I really, really liked the flavor of this! The ingredients paired really well together, and the goat cheese and guac lent a nice creaminess that balanced out the ch orizo. I will definitely be ordering this again. For my entree I decided on the Monte Cristo. I read several Yelp reviews recommending it, and I’m glad I took their advice. This dish is a deconstructed Monte Cristo, featuring maple brined pork tenderloin, French toast, Mornay crema, and a raspberry mostarda. The French toast alone makes it worth ordering. It was custardy, soft and delicious. It made me want to come back to eat brunch here. I made sure to get a little bit of every ingredient with every bite, and OMG was this good. 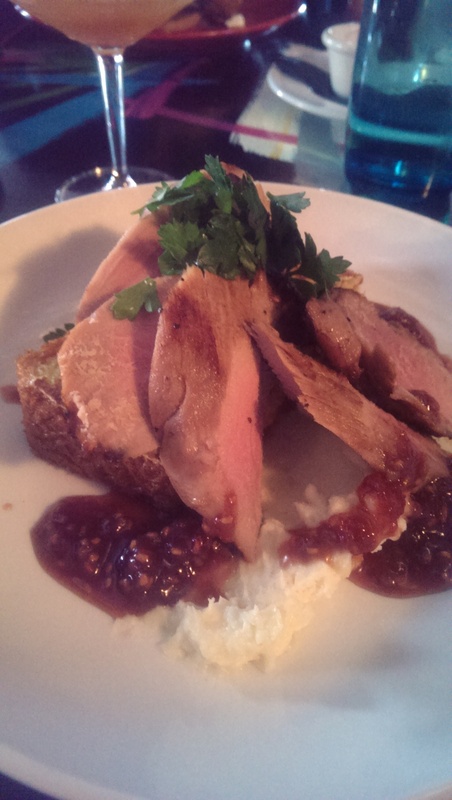 The pork was perfectly tender, and I loved the crema and raspberry flavors together with it. My friends ordered the Graffiti Burger, the Cod and pierogi, the Burrito. They said that the burger and the cod were both a little dry, but they still enjoyed them. My friend N. ended up bringing half of her burrito home and looked forward to the leftovers. The next time I went I was in the mood for something light, so I ordered the BLT Salad (left). 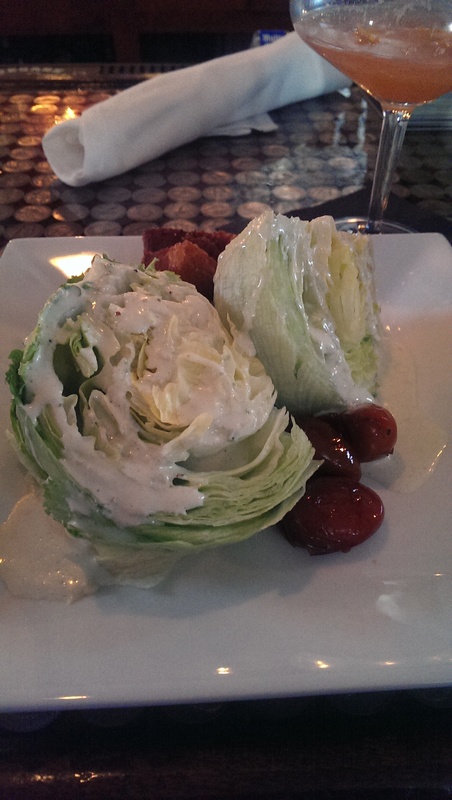 It features iceberg lettuce wedges served with crispy pork belly, balsamic roasted tomatoes, bleu cheese crema, and a delicious buttermilk vinaigrette. The bleu cheese and buttermilk melded together to make a delicious dressing. I enjoyed this salad a lot. 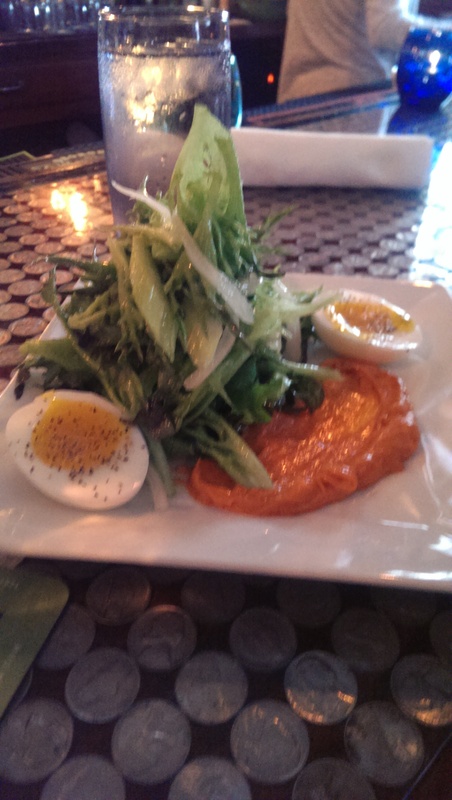 My friend ordered the Egg Salad (right) and was just as impressed with it. In short, this playful and rebellious restaurant is a great addition to the Cleveland dining scene. I plan to add this into my regular rotation. 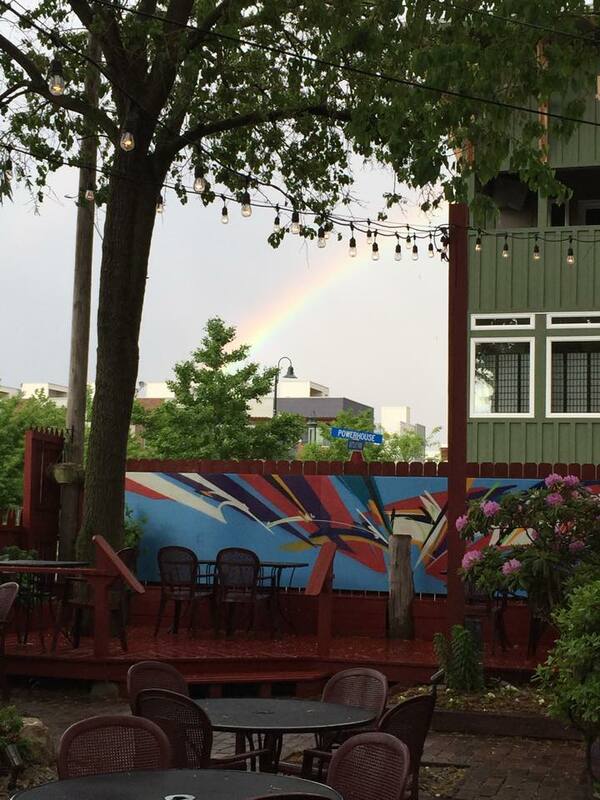 It also has one of the best patios in Cleveland.